Not much doing here peeps, did some instructions, some borders and cracked this open for an upcoming Moda Bake Shop project. What's new with you? Zip, Zero , absolutely NOTHING new here .....YAWN ... but that fabric is pretty darn cute! Can't wait to see what you've got cooking in that creative mind of yours ! Seconding Mary Anne's comment. Summer entertainment is all consuming. Oh, wait, today I'm washing the dogs. And then I will go weep in a corner. But first, I need to go look at Sandy's Wagon Wheels quilt. I love that quilt. Did you see her Happy Campers View Finder table topper?!?! Nothing new here either. I have a week more of watching the grandsons. Then they go back to school and I'm off the hook!!! Love them to death but, whew, they tire me out. I've been attempting to clean my sewing room and will get it finished as soon as they are back in school. Then I can get down to some serious sewing. Actually, fun sewing!!! NOTHING is new with me. As you well know. Sigh...No, I take that back. I'm into a NEW gallon of paint. That's NEW. Nothing new here either. Snoooze. Can't wait to see your next creation - I love Happy Camper - love you! I feel like a teenager... with the "I'm bored" end of summer blahs! (except for a supper simple pincushion that I'm thrilled about for some reason). Charm pack, American Jane-say no more. Off to web-stalk MBS. You rock, girlfriend! I'm painting/redecorating the laundry and half bath area. Haven't touched it since we built it six years ago...that's a record for me! So I'm not playing with fabric Hello Kitty's but I will soon. promise! Ooh! I love that line of fabric! Can't wait to see what you make with it. I WAS doing nothing, but now I am actively hating on Jen Duncan. Ooo, I love Sandy Klop and her fabric. Looking forward to seeing your project. Not much new here, just quilting, sewing, and training the new kitty. He is such a good boy! I've been busy sewing bags this week. 2- Fig Tree Accessory Bags 2- Friendship Bags 1- Tote with a pinwheel (charms) 1- tote with Amy Butler fabrics that I haven't posted yet. I cannot wait to see what you are up to with this cute material. Making hunka's day a special one. But tomorrow it's back to sewing. 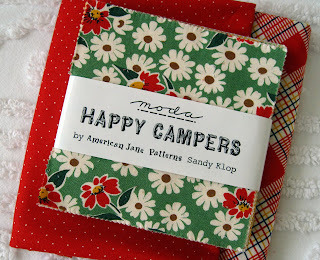 Love that Happy Campers fabric. Whatcha doing with it? I'm finally climbing out of long dry spell. So many great new fabrics bombarding us...now the problem is too many ideas! Love those American Jane lines. Can't wait to see what you do with this one. This has been The Summer of No Interesting Activities for me. All I do is work. The red polka dot and red plaid fabric you are putting with Happy Camper-----are they part of the collection? They are the PERFECT choice. I have a layer cake of Happy Camper Carrie sent me from Market and may have to copy your fabric combinations. Love it. I know I will be able to sew again someday. oh! I almost picked up this fabric this weekend, I love it!